Ten Ren's Whole-Leaf tea bag series offers tea bag enjoyment in a whole new way. 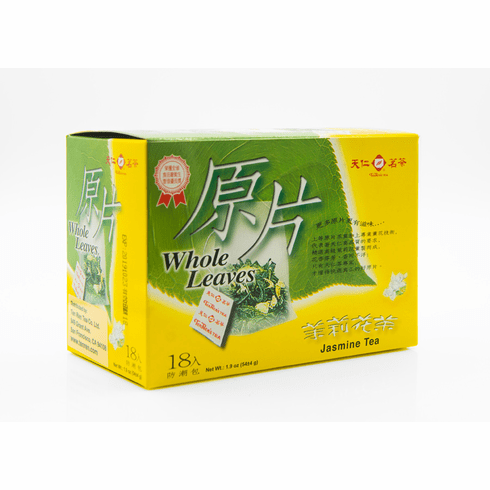 Whole-Leaf tea bags are manufactured with a specially designed new machine that allows the whole tea leaf, as found in our loose tea products, to be placed into a tea bag instead of having to cut the tea leaves into a smaller size. Some tea connoisseurs believe that whole tea leaves are one of the best ways to enjoy tea. This Jasmine tea is composed of Pouchong (Chinese Green) tea leaves scented with fresh jasmine petals. When brewed, it produces a honey yellow hue, an aroma of tropical flowers, and a fruity taste. Water at about 175�F or 80�C should be used for steeping. Available in boxes of 18 bags. Dimensional shipping weight is 0.72 lb.